Norwalk, Connecticut: Easton Press. 1990. First Edition; First Printing. Hardcover. Fine, Accented in 22kt gold, printed on archival paper with gilded edges, smyth sewing & concealed muslin joints. Bound In full leather with hubbed spines. Clean no owner markings or bookplate. A Pristine copy. ; Signed limited edition. ; The Signed First Editions Series. ; 8vo 8" - 9" tall; Signed by Author . 1991-01-08. Good. Ships with Tracking Number! INTERNATIONAL WORLDWIDE Shipping available. May not contain Access Codes or Supplements. May be ex-library. Shipping & Handling by region. Buy with confidence, excellent customer service! 1990-01-03. New. Ships with Tracking Number! INTERNATIONAL WORLDWIDE Shipping available. Buy with confidence, excellent customer service! 1991-07-08. New. Ships with Tracking Number! INTERNATIONAL WORLDWIDE Shipping available. Buy with confidence, excellent customer service! HarperPB. Used - Very Good. Very Good condition. New York: Macmillan, c1990. Third Printing. Hardcover. very good condition/good. 25 cm, 353 pages, illus., tables, index, front DJ flap price clipped, some scratches to DJ. Unusual item--appears to be signed by humorist Dave Barry as Dave "George Will" Barry. Four men who are exemplars of baseball's exacting craftsmanship: manager Tony La Russa, pitcher Orel Hershiser, batter Tony Gwynn, and shortstop (defense) Cal Ripken, Jr.
New York: Macmillan Publishing Company, 1990. First Printing [Stated]. Hardcover. Good/good. Sigrid Estrada (Jacket Photograph), Andrew M. Newm. 25 cm. ix, , 353,  pages. Illustrations. Index. Some soiling/creasing to DJ. Some edge soiling. Signed by the author on the half-title. George Frederick Will (born May 4, 1941) is an American conservative political commentator. Will writes regular columns for The Washington Post and provides commentary for NBC News and MSNBC. In 1986, The Wall Street Journal called him "perhaps the most powerful journalist in America", in a league with Walter Lippmann (1889-1974). His numerous awards include the Pulitzer Prize for commentary in 1977. Often combining factual reporting with conservative commentary, Will's columns are known for their erudite vocabulary, allusions to political philosophers, and frequent references to baseball. Will, a Chicago Cubs fan, has written extensively on baseball, including his best-selling book Men at Work: The Craft of Baseball. He was one of the interview subjects for Ken Burns' PBS documentary series Baseball. Derived from a Kirkus review: Political pundit Will is a baseball buff whose principal claim to fame has been an unrequited passion for the Chicago Cubs. Here, he essays a sort of thinking-man's guide to the national pastime. Will focuses on four real pros: Tony LaRussa (manager, Oakland Athletics); Orel Hershiser (pitcher, Los Angeles Dodgers); Tony Gwynn (outfielder, San Diego Padres); and Cal Ripken, Jr. (shortstop, Baltimore Orioles). The subjects of his profiles, however, serve mainly as departure points for wide-ranging inquiries into base-running, defense, hitting, pitching, stealing (signs as well as bases), and other of baseball's essential skills. The author persuasively rates today's ""physically more impressive"" stars above their storied counterparts of yesteryear. At his best, Will is an informed, frequently astute, student of the diamond. Nice First Edition hardcover, pages are clean, crisp binding tight, light shelf foxing along top and front edge. Cover boards fine, dust jacket near fine, minimal wear from life on a shelf. Signed and inscribed by author on front end paper. First Edition, First Printing with 10-1 number line. In fine, like new condition, clean and unmarked, appears unread, in a fine dust jacket with price intact. Signed by George Will on front end page. G. K. Hall & Company, 1991-06-01. Hardcover. Used:Good. Macmillan Pub Co. Hardcover. 0026284707 New Condition. . New. G K Hall & Co. Hardcover. 0816151504 New Condition. . New. Harper Perennial, 2010. Softcover. New. Printed Pages: 0. Men at Work: The Craft of Baseball Will, George F.
1991-07-08. Good. Ships with Tracking Number! INTERNATIONAL WORLDWIDE Shipping available. May not contain Access Codes or Supplements. May be ex-library. Shipping & Handling by region. Buy with confidence, excellent customer service! 1990-01-03. Good. Ships with Tracking Number! INTERNATIONAL WORLDWIDE Shipping available. May not contain Access Codes or Supplements. May be ex-library. Shipping & Handling by region. Buy with confidence, excellent customer service! The Easton Press. LEATHER BOUND. B00KZB2OC6 Part of the Easton Press Signed First Editions series. Signed by George Will. Full blue leather binding with 3 raised bands on the spine. Clean, has a very good binding, no marks or notations. Gilt tooling and page edges. . Very Good. First Edition. The Easton Press, 1996. Leather Leather. Used Good. Text is in English. Size - H: 9.5', W: 6.5', D: 1.5' This item is Used and is listed as being in Like New condition. Cover clean and undamaged. Spine is intact and tight. Pages are clean and unmarked. Collectorâs edition, bound in green leather with gilt. FF00000005050 We carry new and used books in our storefront. We want you to be satisfied with your purchase. Please contact us if you have questions regarding this item. New York: Macmillan Publishing Company, 1990. First edition. Hardcover. First printing. 353 pages. A collection of baseball essays on Tony La Russa, Orel Hershiser, Twony Gwynn and Cal Ripken. A near fine copy with a former owner blindstamp to the front free endpaper in a near fine dust jacket that is lightly rubbed. Signed and inscribed by Will on the front free endpaper. Harper Perennial, 2010. Paperback. New. 8 x 5.31 cm. Macmillan Pub Co, 1990-03. Hardcover. Like New/Like New. 1990 First Edition, w/full number line. Hardcover w/l.n. dust jacket. As new, mint condition. From The Civil War Book Shop- As close as your computer; as dependable as old Abe. G K Hall & Co. Hardcover. 0816151504 Like New Condition. . Fine. Macmillan Pub Co. Hardcover. 0026284707 Like New Condition. . Fine. Macmillan Pub Co. Used - Good. Ships from Reno, NV. Former Library book. Shows some signs of wear, and may have some markings on the inside. 100% Money Back Guarantee. Shipped to over one million happy customers. Your purchase benefits world literacy! Easton. Used - Good. Ships from Reno, NV. Former Library book. Shows some signs of wear, and may have some markings on the inside. 100% Money Back Guarantee. Shipped to over one million happy customers. Your purchase benefits world literacy! Macmillan Pub Co. Hardcover. 0026284707 . New. New York: Macmillan Publishing Company, 1990. First Printing [Stated]. Hardcover. Very good/Good. 25 cm. ix, , 353,  pages. Illustrations. Tables. Index. Front DJ has small scuff & wear around edges, corners bumped, minor soiling to DJ flaps/endpapers. Four men who are exemplars of baseball's exacting craftsmanship: manager Tony La Russa, pitcher Orel Hershiser, batter Tony Gwynn, and shortstop (defense) Cal Ripken, Jr.
Macmillan Pub Co, 1990-03-01. Paperback. Used:Good. New York: Harper Perennial, 1991. Inscribed to Bill, "Best Wishes," and signed by George Will.. Signed by Author. Later Printing. Soft Cover. Very Good. Macmillan Pub Co, March 1990. First Edition. Hardcover. Like New/Fine. New York: Macmillan Publishing Company, 1990. Book of the Month Club Edition. Hardcover. Very good/Good. 25 cm. ix, , 353,  pages. Illustrations. Tables. Index. DJ has some wear, soiling, edge tears and chips. Corners of some pages bumped. George Frederick Will (born May 4, 1941) is an American conservative political commentator. Will writes regular columns for The Washington Post and provides commentary for NBC News and MSNBC. In 1986, The Wall Street Journal called him "perhaps the most powerful journalist in America", in a league with Walter Lippmann (1889-1974). His numerous awards include the Pulitzer Prize for commentary in 1977. Will won a Pulitzer Prize for Commentary for "distinguished commentary on a variety of topics" in 1977. Often combining factual reporting with conservative commentary, Will's columns are known for their erudite vocabulary, allusions to political philosophers, and frequent references to baseball. Will has also written two bestselling books on the game of baseball, three books on political philosophy, and has published eleven compilations of his columns for The Washington Post and Newsweek and of various book reviews and lectures. 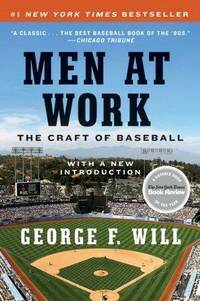 Men at Work: The Craft of Baseball is a New York Times best-selling 1990 book about baseball. It was written by American Pulitzer Prize-winning author George Will, and published by Macmillan Publishers. The book focuses on four successful Major League Baseball figures, three of them players, representing different aspects of baseball: a manager, a pitcher, a hitter, and a fielder. In preparation for Men at Work, Will spent hundreds of hours interviewing four Major League Baseball figures: right fielder Tony Gwynn of the San Diego Padres, manager Tony La Russa of the Oakland Athletics, shortstop Cal Ripken, Jr. of the Baltimore Orioles, and pitcher Orel Hershiser of the Los Angeles Dodgers. He discussed each person's approach to the game of baseball, choosing them because of their success in their roles and their strong work ethics. While researching for Men at Work over a period of three years, Will acquired 11 press passes that offer special locker-room privileges in Major League Baseball stadiums. In the book, Will discusses how each of the four subjects highlighted play, or in the case of La Russa, manage the game of baseball. It also discusses the history of the game, such as how Candy Cummings invented the curveball pitch in 1867. There are also statistics mentioned, as well as anecdotes. Men at Work was published in 1990, a few days following the 32-day-long Major League Baseball lockout. The book has been described as taking a more serious approach to baseball than other books on the same subject. Reviews have complimented Will's discussion on baseball strategy and his approach to current baseball debates. The book was number one on the list of New York Times Non-Fiction Best Sellers for at least nine consecutive weeks immediately after its publication, making it one of the best-selling baseball books since Major League Pitcher Jim Bouton's Ball Four (1970). New York, NY, U.S.A.: HarperTrade, 1991 Underlining on page 7.Page 9 top corner page dog-earred.Otherwise in very good condition.Signed "To Randy,Best Wishes,George Will".. Signed by Author. Trade Paperback. Good/No Jacket. 8vo - over 7¾" - 9¾" tall. Macmillan Pub Co, 1990-03-01. First Edition. Hardcover. Very Good. First edition, first printing, full number line starting with "1". DJ intact and in very good condition. Appears unread. Minor wear, mostly around the edges. No markings noted.. Unconditional money back guarantee. Harper Perennial, 2010-04-13. Reprint. Paperback. Used:Good. New York: Macmillan Publishing Co., 1990. First Edition. Hardcover. Near Fine/Very Good Plus. New York: Macmillan Publishing Co., 1990. Book has minor shelfwear, dj has small tear, scuffing & minor shelfwear.. First Edition. Hard Cover. Near Fine/Very Good Plus. 8vo - over 7¾" - 9¾" tall. New York: Macmillan, 1990. 1st. Hardcover. Near fine/very good. Bound in publisher's original quarter cloth and black paper over boards, spine stamped in gilt. New York: Macmillan, 1990. Hardcover. Near Fine/Near Fine. First edition. Near fine in near fine dustwrapper. Corners slightly rubbed. Slight shelf rubbing to dustwrapper. Please Note: This book has been transferred to Between the Covers from another database and might not be described to our usual standards. Please inquire for more detailed condition information. Men at Work: The Craft of Baseball. Easton. Hardcover. B001KWORLU Very Good Condition. Has some wear. Five star seller - Buy with confidence! . Very Good. Easton. Hardcover. B001KWORLU Very Good Condition. Tight and Neat. Five star seller - Buy with confidence! . Very Good. Harper Perennial. PAPERBACK. 0061999814 Special order direct from the distributor . New. Easton. Hardcover. B001KWORLU Very Good Condition. Has foxing. Has some wear. Five star seller - Buy with confidence! . Very Good.